This article on the Huddersfield Daily Examiner is entitled Important Timetable Changes For Huddersfield Rail Passengers Heading To Manchester. It is a good explanation of the major changes that will take place to TransPennine Express services after the 20th of May. But nothing is said about Northern services. I suspect, it will be sorted by the time the service starts. I would check before you travel. Hopefully, if you want to go to Piccadilly and get on a train that only goes to Victoria, it will be a same platform interchange to continue, your journey if your ticket is marked Manchester Stastions. I would assume that you won’t be able to touch in with a contactless card on this short journey as is becoming the norm in a lot of the World. Ticketing in the North is so Nineteenth Century. Do A Lot Of Other Cities Need An Overground? This article on the MayprWatch web site is entitled London Overground Celebrates Ten Years Of Transforming Rail Travel In The Capital. The principles behind the Overground are simple. Bring run-down suburban railways under local control. Run four trains per hour on all routes. Introduce contactless ticketing with Oyster and bank cards. Have lots of visible well-trained staff. Upgrade stations and step-free access, when money allows. Increase train length to match passenger numbers. Allow disabled passengers to just turn up and get the assistance they need. Add lots of passenger information. The principles certainly appear to have worked. This is from the MayorWatch article. This investment, which started under Mr Livingstone and was continued by his successor Boris Johnson, has helped the London Overground become one of the UK’s most successful rail services, with independently measured passenger satisfaction scores routinely above 80%. Since launch, more than a billion passenger journeys have been made on the network which now serves 23 of the Capital’s boroughs as well as southern Hertfordshire. In 2018, new Class 710 trains will replace the thirty-year-old Class 315 trains on West Anglia routes to Cheshunt, Chingford and Enfield Town. In 2018, the newly-electrified Gospel Oak to Barking Line will change over to four-car Class 710 trains to double capacity. In 2018, Friday and Saturday night services will start on the East London Line. By 2020, service frequencies on the circular North, East, South and West London Lines will have increased to decrease the overcrowding. In 2021, the Gospel Oak to Barking Line Extension to Barking Riverside will open to serve ten thousand new homes. In 2026, the North London Line will join the big party at Old Oak Common station, when HS2 opens. Could the West London Orbital be the next project? Transport for London would love to get their hands on the Northern City Line. This proposal is supported by many Londoners, polticians and rail professionals like Chris Gibb. So long as passengers turn up, we will see increasing amounts of orange on London’s Rail and Tube Map. 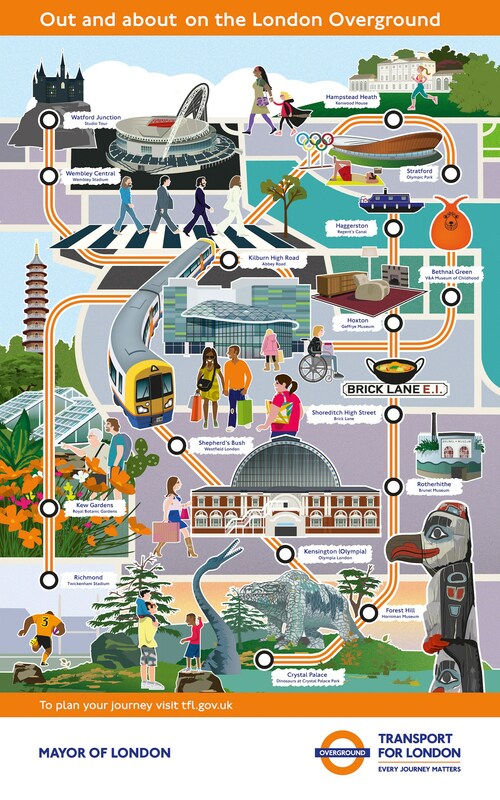 To celebrate ten years, London Overground have released a map showing attractions that are accessible from the Overground. The Overground could become a tourist attraction in its own right. No special ticket required – Just touch in and out! Many of the attractions served by the Overground are affordable or free. Trains have a frequency of at least four trains per hour. Stations generally have good directions to local attractions. In addition, Overground trains have better views from the windows than Underground trains. When I moved to Dalston in 2010, the Overground had just opened to four station within walking distance; Canonbury, Dalston Junction, Dalston Kingsland and Haggerston. New three-car Class 378 trains ran to Clapham Junction, Crystal Palace, New Cross, Richmond, Stratford and West Croydon, every fifteen or so minutes. Now the trains have grown to five-cars and there is an extra route across South London to Clapham Junction to complete the circlke around Central London. Passenger numbers have grown with the capacity and the railways have transformed Hackney and Dalston in particular. Several cities in the UK have their own local rail networks that are heavily used for commuting, leisure, shopping and tourism. I’ve rode on systems in Birm,ingham, Glasgow and Liverpool, but none of these railways is as easy to use and as travel information-rich as the London Overground. Not one of the UK’s local networks for instance, allow ticketing by using a contactless bank or credit card. But then, with only a couple of exceptions, European networks are no better than the abysmal norm! I believe that every local rail or Metro network, should support ticketing using contactless bank or credit cards. There is no need to buy a ticket or a special electronic travel card. A maximum daily, weekly or monthly cap can be applied. \Entry and exit at stations is quick and easy. I also feel that cities that don’t go this route will lose out, as tourists will go elsewhere. New Metros in Europe and the rest of the world, shameslessly copy the features of London’s iconic Tube map for one of their networks. But often for various reasons, they position them high-up and make it that you need to be over six foot tall to read them. Every network, should have a large map, that is at least the size of London’s with the stations laid out in an easy-to-read format, that can be read by anybody from an eleven-year-old child to an eighty-yrear-old with failing eyesight, sitting in a wheelchair. London’s maps aren’t perfect, but they are a good start! I know the Merseyrail network well and it probably comes closest to the London Overground in terms of operation. But, in terms of Marketing, I don’t think it does is best to sell itself to visitors. Is a big change about to happen in Birmingham? This article in the Railway Gazette is entitled West Midlands Trains Announces London Northwestern Brand. This is also said about services in Birmingham. Services operating around Birmingham are to use the West Midlands Combined Authority’s West Midlands Railway branding, with a view to facilitating the possible future devolution of responsibility for these services from the national Department for Transport to the authority. So will Birmingham improve its local rail offering? It’s certainly going to have new trains and an expanded service, so will they add the following. A route pattern and map, that is understandable to non-Brummies. Dedicated local platforms at New Street station. More visible staff on the platforms. The bare bones are there, but they need a lot more flesh! The world needs to develop more Overground networks as London has done!